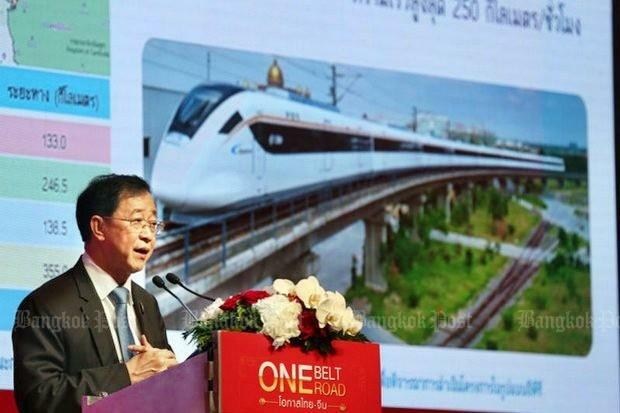 Minister of Transport Arkhom Termpittayapaisith favours Chinese help in building a high-speed train network but the project has fallen far behind schedule. The Thai-Chinese high-speed train project could face a construction delay due to different measurement systems of the track specifications. Speaking after a meeting on the project, Chaiwat Thongkamkoon, director-general of the Office of Transport and Traffic Policy and Planning (OTP), said the office has instructed the State Railway of Thailand (SRT) to expedite the design of the tracks, which will be put to the test on a 3.5km-track section from Klang Dong to Pang Asok in Nakhon Ratchasima. The section is part of the 252.5km Thai-Chinese high-speed train project, from Bangkok to Nakhon Ratchasima, worth about 179 billion baht. However, China uses its own measurement system for its tracks and this must be converted into the Thai system, which could delay construction of the line. China is hiring Thai experts to address the problem, before the project bidding and construction can begin, he said. The test line is scheduled to be constructed next month. Besides the track issue, the OTP also ordered the SRT to speed up the drafting of three contracts under the project to be submitted to the cabinet for consideration. Mr Chaiwat said that when the measurement and the contract issues are finalised also depends on China. The office would stick to the government’s project framework. He said he hopes both issues can be resolved before the 17th meeting of the Thai-Chinese panel overseeing the high-speed railway project to be held in Beijing soon. The meeting, initially scheduled for Jan 17, was postponed by China. A new date has yet to be set. Meanwhile, a source at the SRT said most problems in the project were solved, except the track and contract issues which could delay construction. China has been unable to issue the project’s documents in compliance with Thai law, meaning the Finance Ministry is unable to approve the budget for the project. According to the source, China submitted the design for the tracks to Thailand last year. The SRT has also employed consultants to examine the track design submitted by China. The other issue is the design standard. The source said more than 50% of the 3.5km test track’s design has been readjusted while the Thai experts were required to look into complicated details of the project. SRT governor Wuthichart Kalyanamitr insisted China will be responsible for finding its own Thai experts to work on the design. Transport Minister Arkhom Termpittayapaisith said he had not received a report on rail track’s design problems yet.